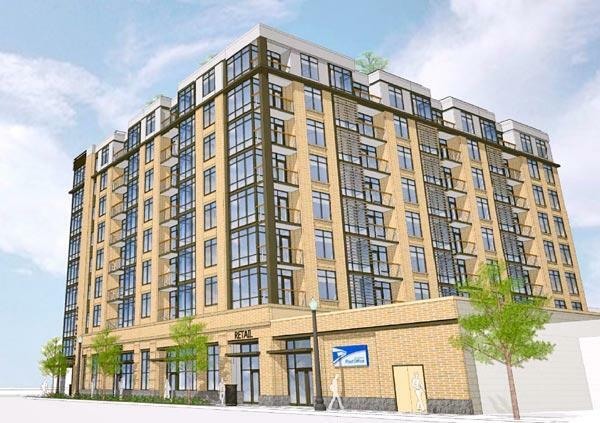 ANC1A Supports Extention of PUD for 3321-3335 Georgia Avenue | Park View, D.C. The Vue as proposed for the southeast corner of Georgia and Morton. On September 13, 2017, ANC1A voted unanimously (resolution here) to support a third extension of the approved Planned Unit Development that has been in the works for the southeast corner of Georgia Avenue and Morton Street since late 2010. The hold up on the project has been the removal of underground storage tanks that served the site when it was a Sunoco gas station. The tanks leaked and the parties are working with the Department of Energy and the Environment to establish an approved work plan for remediation. As the amount of remediation has a direct impact on the construction of the building’s foundation, the owner has been unable to apply for the building permit — triggering the request for an extension. There has also been two owners of the property, the Neighborhood Development Company originally and Zuckerman Gravely following the first PUD extension. At the ANC meeting, the conversation centered on three areas of concern, 1) the environmental issues, 2) the community benefits, and 3) the timeline of the project. As the Commission considered the issues, there was quickly consensus that the shortest path to a new building would be an extension and that the environmental issues would be addressed by the construction process. Furthermore, the soil contamination is not currently a hazard to any of the businesses operating at the strip mall on the property. It was also agreed by the ANC and property owner that the original community benefit approved for the PUD was no longer possible and agreed to enter into an agreement to renegotiate the benefits agreement prior to the start of construction or breaking of ground. As the project no longer has an approved amenity, it is in the best interest of the developer to begin working with the ANC to address this shortcoming. This is especially true as the building would be unable to get a Certificate of Occupancy for the building without delivering an appropriate community amenity. With these issues considered and upon reviewing the materials relevant to the case, ANC1A believed that the environmental and remediation issues which have delayed this project and necessitated an extension request should be resolved in the coming months. Due to this the Commission voted to support the case but also decided that it would not favorably consider any future extension applications of this matter. This entry was posted on September 27, 2017 at 7:01 am and is filed under Development, Housing. You can subscribe via RSS 2.0 feed to this post's comments. Thanks Kent! Been wondering about what was holding up the development here. Would the success of the Midlands be a factor in the ANC’s decision to move forward with development here, or was the strip mall occupancy always meant to be a temporary thing? I understand some of the reasons laid out but come on seriously you know that Zuckerman Group is simply going to sell the land (again) after this expires for a profit. The old group NDC that owned it determined they could move forward with development within a year. They have shown very little motivation to develop any properties they are land-banking on GA. Take the old Murray’s lot which would already be an up and running Red Brick development if Zuckerman didn’t buy it several years ago. These guys have stalled that section of GA and the ANC just rewarded them. Yes, exactly. And meanwhile the city claims they have to give a park to a developer because there’s no where on Georgia Ave to build housing, and the ANC and our councilmember bend over backwards to enable them. I know DC is developer-friendly, but our credulous ANC supporting this is pretty amazing. They’ve got a beer garden sitting in the parking lot they’re supposed to be remediating. See the comments here…exactly. No one is fooled by developers making up stories in order to make a buck. So let’s hope for progress this coming year…. Good, they should’ve been paying the vacant property tax for a long time already at 3400. I wouldn’t hold my breath as they have owned numerous GA properties for years now and not.a.single.movement.yet.